Sometimes a game just doesn’t work out. Despite lots of time, a strong property, and capable development talent, the experience fails to solidify. In the case of Overkill’s The Walking Dead, major technical problems and connection issues, baffling gameplay systems and controls, tedious combat and stealth, and poorly structured missions all contrive to halt the fun. & A deep and rewarding upgrade and progression path hides behind the mess, but you’re unlikely to enjoy it, as the game fails to offer meaningful engagement. 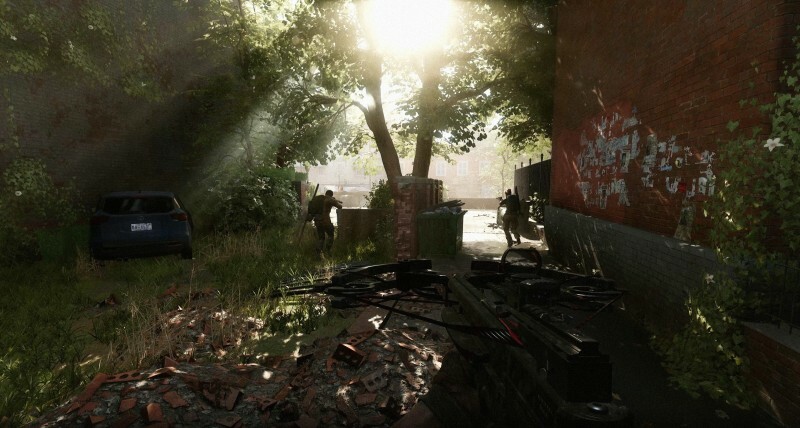 In this four-player, first-person survival shooter, players take on new characters in The Walking Dead universe, but face gruesome challenges similar to those seen in the comic and TV shows. Working as a team, you scavenge for supplies and face off against enemy survivor groups, then defend your camp from those that would take what you have. The story is too bare-bones to hold up to scrutiny, though I appreciate the effort to surprise, including at least one cool character twist. While purporting to be balanced for solo players or teams of various sizes, most missions are profoundly disheartening with anything less than a full four-person team. That’s a big problem, because matchmaking is spotty, and it is often unable to find me a matching team. Load times are long, and failure in a mission means starting over from the beginning. This can result in losing 30 minutes or more of time, with paltry rewards to show for the effort. When the games does manage to find a match, I’m often thrown in halfway through with the team already most of the way to failure. I’ve also encountered many hard crashes, together amounting to hours of lost progress. Enemies are a mix of mindless undead and nearly mindless enemy survivors. The human enemies lack any of the tactical complexity you’d expect from any FPS of the last 10 years, often standing together in groups as you gun them down, even as they fail to animate in response to a hail of submachine gun bullets. Gunplay is stiff and unresponsive. More prominent and frequent are lengthy sections of unsatisfying melee engagements. Whether bashing with a baseball bat or slashing with a machete, the close-up battles lack variety or panache, and regularly devolve into long stretches of standing in a doorway and repeatedly smashing the left mouse button for minutes at a time. A lackluster stealth system may as well be absent; it lacks sufficient cues to help you be successful, and the level design and enemy placements provide too few opportunities to be sneaky. A punishing sound meter discourages the use of your more interesting weapons and abilities, since it means that the zombie horde will soon descend. Upon death, an infuriatingly long respawn timer gives you just enough time to fume about the futility and loss of your free time. The relatively small number of environments are confusing to navigate, with procedurally placed elements that frustrate as often as not, as you scramble around attempting to find the necessary jumper cables or gasoline. You’re encouraged to spend increasingly boring stretches scouring for additional bullets and supplies, slowing down any momentum a mission might have had. The lone standout success is a rewarding progression system, which offers a lot to explore and plenty of opportunities for experimentation. Classes have their own leveling trees to improve abilities, though I would have liked more flexibility to customize what weapon skills each character can improve. As it is, if you like a particular ability, like the Scout’s smoke grenade, you’re obligated to go with her crossbow and pickaxe. Additional supplies let you upgrade your camp in a variety of ways, but you must balance your expenditures against the ongoing upkeep needs of your survivors, which makes for a compelling tension. As you gather more survivors, you can alternately send them out on missions or set them to work in the camp for some handy bonuses. Finally, a wide variety of weapons can be modded and improved over time. I appreciate the feature, but it also means that you’re wielding especially clumsy weapons in the early hours. Nonetheless, the growth of your camp and characters provides a sense that your missions have meaning, and may be enough to push you back into another banal scavenging run. Overkill’s The Walking Dead plans to dole out content in seasons, so the current batch of missions will soon expand. But dramatic reworking of most core combat and mission systems are necessary before the game could be worthy of a recommendation. The premise sounds promising for fans of cooperative play, zombie action, and the taut survival storylines implied by the license. The execution fails to meet the needs of any of those groups. You’re better off heeding the warning – keep this menacing door closed, and leave the zombies to their gnawing hunger.